One of the difficulties in identifying specific individuals in the epigraphic evidence of the ancient world is being able to determine with any surety if different texts that contain the same name actually refer to the same person. Moreover, even with a large corpus of evidence, it can be unlikely to understand clearly what that person’s role was in society. An intriguing example of this comes in the guise of a female resident of Nuceria, a town approximately eleven kilometers from Pompeii, by the name of Primigenia. ut tibi signanti oscula pressa darem. and smoothly fit the right finger with your true band! now I’m sadly envious of my own gift. by the art of Circe or old Proteus! and with wonderful art fall into the loose folds. so that sealing the work would give me no pain. I’d cling, a shrinking ring, to your finger. so your tender finger refuses to carry the weight. 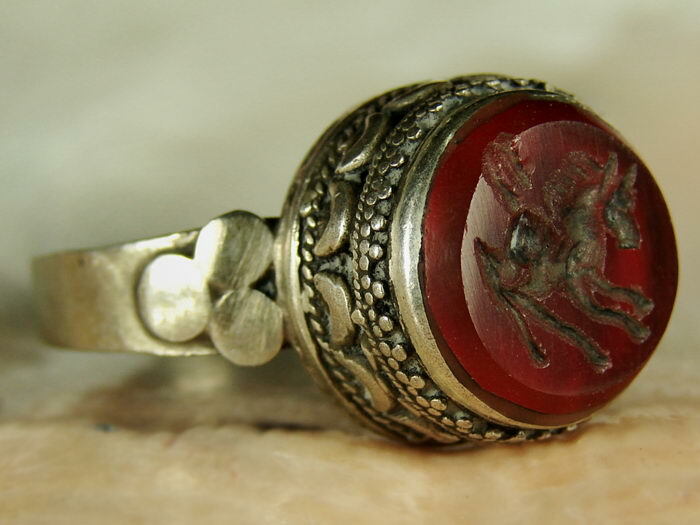 and, as that ring, I’d carry out a man’s part. show her that true loyalty comes with you! Della Corte takes this text as proof the woman named in the couplet and this Novellia Primigenia are one and the same, as both hail from Nuceria. He further supposes that she must be a descendent of Gaius Novellius Rufus, as he is the only citizen of the gens attested epigraphically in the region, who coincidentally has a tomb in Nuceria (CIL X 1097), in a district that still retains the name of Porta Romana. a Messio numulario Hermerotem Phoebi. For Della Corte, this is proof positive that Primigenia was ‘an intellectual of distinction’ who was engaged in a ‘literary and artistic tour’ from Nuceria through Pompeii, Herculaneum, (undoubtedly also) Naples, and Puteoli. What Della Corte fails to mention, however, is that there are at least six different men linked to Primigenia in more than twenty graffiti that name her. Sabinus, Secundus, Lucius Isticidius, and Cornelius Carito are just some of those who recorded time spent with Primigenia (CIL IV 5538, 8769c, 8260a 3976, 4270). The majority of the texts do not name an author, but instead offer their greetings to the woman who is described as ‘most sweet, most lovable’ (CIL IV 8177 dulcissimae amatissimawque) and beautiful (CIL IV 8301 [Primig]eniam quam feli(citer) mirati sumus. ’With what joy of the eyes have we admired Primigenia!’). Whether there are as many scribblers as there are texts (or, in fact, as many Primigenias) is extremely difficult to determine. The frequency of this woman’s name in texts describing her attractive attributes in conjunction with multiple men has led some scholars to interpret her status in a different manner than Della Corte. Both Varone and Lancaster view Primigenia as a high-grade prostitute, a well-educated courtesan who may have been an actress. Topographical evidence further supports this conclusion – the graffito of Hermeros was found in the men’s baths in Herculaneum, one Pompeian graffito was found in the lupanare, and her own address is suspect for it’s location in a vicus named for Venus, the goddess of love. So who was Primigenia really? A well-respected aristocratic woman renowned for her intellect, or a prostitute of some reputation whose liaisons were recorded by many a satisfied customer? It is unlikely there will ever be a conclusive answer to that question, but piecing together the evidence is a lesson in itself, in that no matter how much evidence there is for an individual, teasing out the true nature of that person’s life is rarely going to be more than speculative. 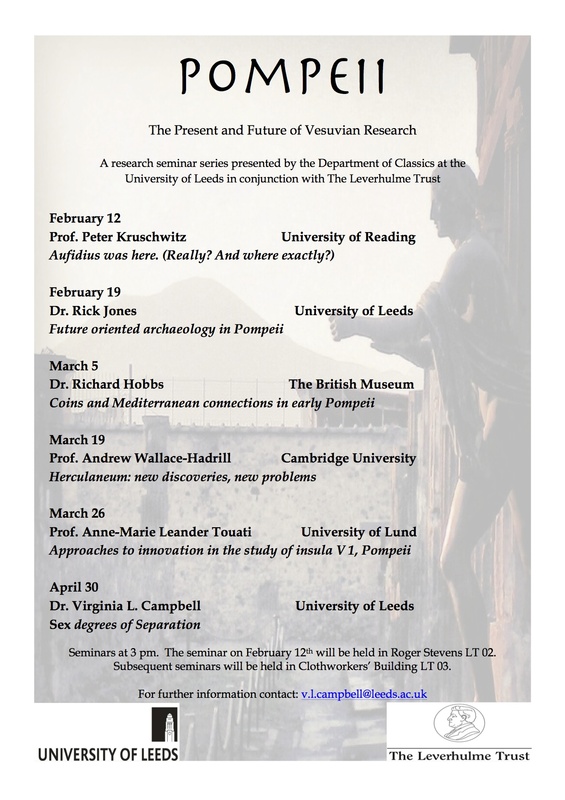 As part of the Leverhulme Trust funded research project on Social Network Analysis in Pompeii, in conjunction with the Department of Classics at the University of Leeds, a research seminar series on current and future work in the Vesuvian region has been organised for the Spring semester 2014. All are welcome to attend. For further information, please contact: v.l.campbell@leeds.ac.uk.